Repetition is an important part of the learning process, and little kids have an amazing capacity for repeating things endlessly (and driving their family crazy). But as you get older, you quickly realize that repetition is dull and boring. Not only is repetition sleep inducing, it’s an ineffective memorization technique. Some amount of repetition is necessary for learning, but you should combine it with other learning methods for the best results. If you’re a crazy person and you’re determined to memorize the names of 118 chemical elements just by repeating them endlessly to yourself, here’s a four step action plan for you. 1. Memorize chunks of five elements at a time. You’ll have 23 separate groups of five to learn, with a few left over. Chunking is like eating an elephant one mouthful at a time. It doesn’t make it taste any better, but it makes it possible. 2. Recite the element names out loud. Yes, you’ll announce to the world that you’re a crazy person, but reciting out loud is more effective than repeating elements silently in your head. It forces active learning, makes you pay attention to what you’re doing, and you get instant feedback on your progress. 3. Space out your learning sessions. Three separate one hour sessions will be more effective than a single session of three hours. Your brain has time to rest and re-focus, and the new information has a chance to consolidate in your mind. What does that mean? When you get to the point where you can successfully recite a list of elements once, don’t stop. Overlearning is learning beyond the point of simple recall, and it effectively strengthens both how well you know something, and how fast your mind can retrieve that knowledge. To remember new information it should have meaningfulness and be linked in your mind to other things you already know, and learning by rote doesn’t do that. And that’s why repetition alone is an ineffective way to learn. Let’s be real. Repetition is boring and takes a looong time. Some people might push through the pain and memorize the periodic table this way, but honestly … why? The value of using flashcards might not be what you think. Flashcards are a tool that helps you use repetition, and we know that repetition isn’t the most effective memorization technique. However, the act of creating flashcards and physically using them is a more active way of learning than just repeating words in your head, and that’s a good thing. Physically writing and making flashcards with the names of the chemical elements requires more interaction and engagement with the periodic table and that will help your learning process. Flashcards can also be convenient to carry with you, meaning you can practice when you’re on the bus or waiting for your friends. Geeky? Yes, but nobody said memorizing the periodic table ranks high on the spectrum of cool. If you decide flashcards are your thing, use them in combination with the four step framework for repetition. 1. Learn elements in small groups of five or ten. 2. Recite the element names out loud and only refer to the flashcards to assist you when you get stuck. 3. Space out your learning sessions and take advantage of the convenience of flashcards to do learning and revision when spare moments appear in your day. 4. Don’t stop learning when you can recite a list of elements successfully once, but keep going and really hammer it home. Bottom line, flashcards are an active and convenient way to use repetition and practice recall. But it’s still going to be a time consuming way to learn all 118 elements. No shortcuts here. To help remember the musical notes on the lines of the treble clef, you might have learned the sentence “Every Good Boy Deserves Fruit”. That’s an acrostic. You could use the acronym HHeLiBeBCNOF (pronounced ‘heeliebeb kernoff’) to remember the first nine chemical elements. It's a nonsense word, but it condenses nine names into one mental prompt or cue. Or the acrostic “Here He Lies Beneath Bed Clothes, Nothing On, Feeling Nervous” would equate to H He Li Be B C N O F Ne. Acronyms chunk words together, which is good (even if they are nonsense) and acrostics use more meaning, but either way you'll only have the first letter or two to remind you of each element's full name. That's tough for 118 elements! Verdict? The first letter cues don’t prompt you enough to recall the complete element name, so acronyms and acrostics can be great for the first 20 elements, but not for all 118. People get seriously crazy about periodic table songs. They’re popular - whether you’re a fan of Tom Lehrer or AsapSCIENCE - but popularity doesn’t necessarily translate to effectiveness. A catchy tune gives better association and meaning than acronyms and acrostics, and the dull repetition is a lot more enjoyable … but you still have to rely on bucketloads of repetition. And that means your iPod will need to be on continual repeat for a week, because repetition will still be the key. Ugh! Remember the difference between your verbal and visual memory? Songs use your verbal memory. Assessment: They’re a great way to make repetition fun, but songs don’t tap into your powerful visual memory. No.1 Mental Imagery - How to Learn the Periodic Table Like a Memory Rockstar! How can you memorize the periodic table in one night? You emulate best-practice memorization techniques and do what memory experts do. Common sense, right? Memory experts and world champion memory ‘athletes’ activate the enormous natural power of their visual memory by using visualization and association mnemonic techniques. That’s a fancy way of saying they create mental pictures and link them together in their mind. It’s incredibly simple but amazingly fast and effective. Watch YouTube’s #1 “How to Memorize” video and you’ll amaze yourself with how easily you can remember and recall 15 random words in order, using one of these techniques. The method used in that video is called the Link and Story Method, and it’s based on the principles of visualization and association. How do you apply it to the periodic table? The chemical elements themselves can be difficult to visualize, so you substitute each element with an image or object you’ll naturally associate or link to the element itself. For example, ‘hydrogen’ sounds similar to ‘hydrant’, so when you visualize a hydrant wrapped in a poster of the periodic table, you’ll be prompted to remember ‘hydrogen’. When you picture a large helium balloon lifting the hydrant off the ground, you’ll remember helium. And when the balloon begins to ‘lithp’ (how people with a lisp pronounce ‘lisp’), you’ll be prompted to recall lithium. The weakness of this method is the amount of time it takes to create the (intentionally) bizarre and crazy story to link all the words (or chemical elements) together. The technique most memory experts use is the Method of Loci (or Memory Palace or Journey Method), and it’s the Rolls Royce of memory techniques. Think of a particular journey you take every day, and picture certain locations along the way. For example, imagine leaving home in the morning and travelling to work or school. You might walk out your front door, through the front gate, and get on a bus. At each location you visualize an object that represents what you’re trying to remember. When you picture a hydrant sitting at your front door, you’ll recall ‘hydrogen’. When you imagine a bright colored helium balloon tied to your front gate, you’ll remember helium. And when your bus begins talking with a ‘lithp’, you’ll be prompted to recall lithium. Once you have a set mental journey, you simply place an image in each location. To recall each element, just travel the journey and see each image in your mind. Because you don’t need to write a crazy story linking each image together, the Memory Palace Method is much quicker than the Link and Story Method. And that’s why it’s the foundation technique of memory experts – it’s a fast way of activating your powerful visual memory. These established memory techniques have been proven by over 50 years of academic research in fields like cognitive psychology. Google ‘memory palace’ or ‘world memory champion’ and you’ll discover they’re the fastest and most effective methods to memorize a deck of playing cards and a lot of other geeky things. Bottom line, you should play to your natural strengths. Your brain loves pictures. And that makes visual memory techniques 10X more powerful than verbal memory techniques (like songs and acronyms) to memorize the periodic table. If you’re a typical student, you want the fastest and easiest way to memorize the periodic table. - Repetition alone takes a loooong time, and results in low ‘stickability’ (also known as effective recall). - Flashcards are a convenient and more engaging approach than repetition by itself, but you’ll still be stuck in a world of meaningless repetition. - Acronyms and acrostics are alright if you only need to know the first 20 elements, but not for all 118. They don’t give you enough mental prompt. - Songs are a fun way to battle repetition, but you can’t listen to the same song 137 times without your brain melting down. And it still won’t activate your visual memory. - The Link and Story Method taps into your powerful visual memory, making it incredibly effective. But the time to write the story is going to take as long (or longer) than using straight repetition. 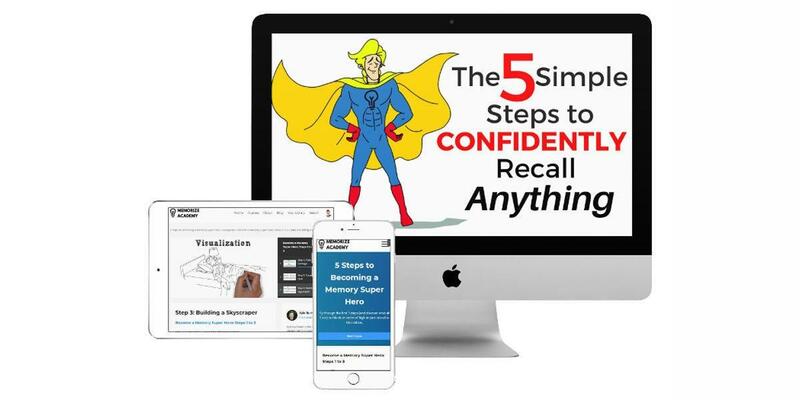 - You won’t need to write a story for the fantastic Memory Palace Method, but there’s no avoiding the fact it’ll still take work. We took the second best visual memory approach (the Link and Story Method) and did ALL the work for you. That’s right, we created visual images for 118 element names and joined them all together with a completely crazy (and memorable) story. And then we turned it into an animated video series! Memorize the first 20 elements of the periodic table for FREE. This animated video course is the fastest way to memorize the periodic table because it uses best-practice visual memory techniques. You just need to sit back and watch, and let the amazing natural power of your visual memory do its thing. How fast will you be able to memorize the entire periodic table? You can do it in ONE NIGHT.